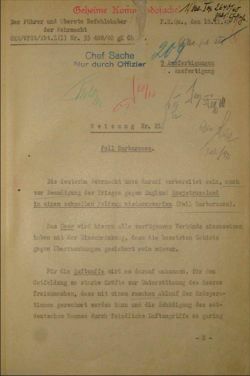 Hitler's War Directive No. 21 ordered preparations for Operation Barbarossa, the invasion of the Soviet Union. On June 22nd. 1941, Germany launched an invasion of the USSR, Operation Barbarossa. At the time this happened, although Operation Sealion (the planned invasion of England) had been effectively cancelled, it was only officially postponed (it was not officially cancelled until 1942). The element of surprise was of crucial importance for Operation Barbarossa. For example, in Hitler's War Directive No. 21, ordering preparations for Operation Barbarossa, he stated "It is of decisive importance that our intention to attack should not be known.". In order to increase their chances of achieving the necessary surprise, the Germans made use of their plans for Operation Sealion as deception plan - to try to make their enemies think they intended to attack England rather than the USSR. There were two parts to the deception plan. Operation Shark (Haifisch) began in April 1941. It was intended to give the impression that the Germans would launch an invasion of England, with the German navy (Kriegsmarine) ferrying troops from Rotterdam, Cherbourg, and other major ports, to invade England at Folkestone, Worthing, and other points on the South coast.